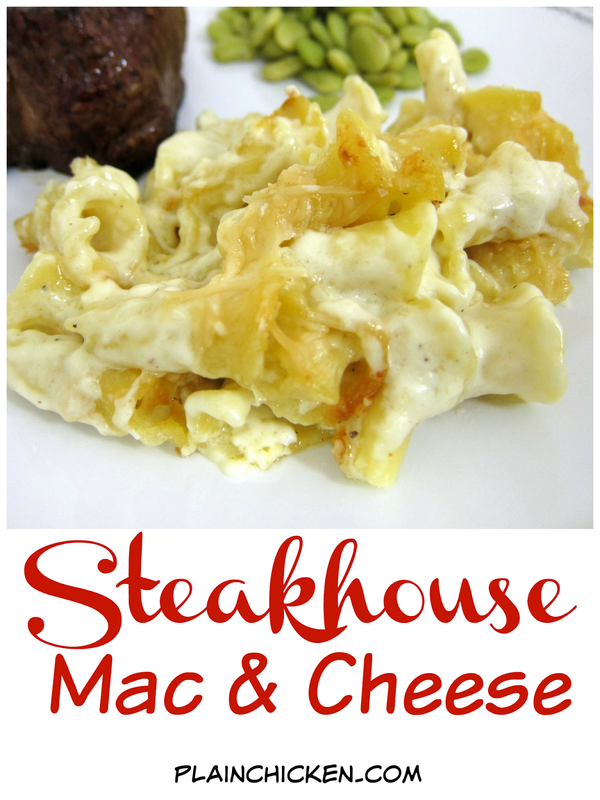 Steakhouse Mac and Cheese - copycat from Seagar's Steakhouse in Destin, FL - pasta with camembert and provolone cheese - THE BEST mac and cheese! We went down to the beach for Thanksgiving. The weather was amazing and we had a wonderfully relaxing time. Our favorite dinner was at Seagar's in the hotel. The food was incredible. My favorite part of the meal was the macaroni and cheese. It was to-die-for delicious. It was so good, that we went back on our last night and shared a crab cake (it was more like a crab boulder) and an order of the macaroni and cheese. I decided to try my hand at recreating the macaroni and cheese at home, and it turned out great! Chicken Legs said it tasted better than the original. This macaroni and cheese uses Camembert cheese. This was the first time we had heard of it. It is similar to brie. We picked up a wheel form Whole Foods and quickly realized that it stinks to high heaven. OMG! Make sure you buy this the day you make it and go straight home. (The macaroni and cheese doesn't stink - I promise). It is incredible that something so stinky can taste so amazing. Best macaroni and cheese EVER! I am already planning on making this again. Melt butter in a large sauce pot over medium heat. Add flour and cook 1 – 2 minutes, but do not brown. Add cream, milk, salt, pepper, onion powder and garlic powder. Bring pot to a simmer. Cook until sauce is thick, about 5 – 6 minutes. Blend cheese into sauce and add cooked pasta. Pour pasta and sauce into a 9-inch square baking dish. Bake for 20 minutes. In France and England we keep the Camembert until it is very soft. It helps if you have a fridge in the garage though as you don't want it in your kitchen fridge hahaha! This looks divine! And Camembert is super cheap here in Europe so even better! That's a great compliment when you make something better than the original. I love your recipes. This is another that I will have to put in my favorites file and I haven't even tried it yet. This sounds soooo good! I'm going to give it a try because I LOVE mac and cheese. Thanks! This cheese combination sounds great Steph and I'm not surprised yours was better. I've never heard of that cheese either, but judging by your photos, it clearly does something good for mac & cheese! Looks like creamy, dreamy bliss. I couldn't find the camembert cheese, so I substituted regular cream cheese. This is my favorite mac & cheese out of several recipes I've tried so far. I'm sure it's even better with the right cheese. A good substitute would be "Brie"